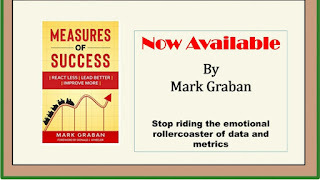 Over the past few years, while discussing what Lean is with people, I have had one or two of them make comments to the effect that they weren’t interested in learning about anything coming from Japan (or any other foreign country!). 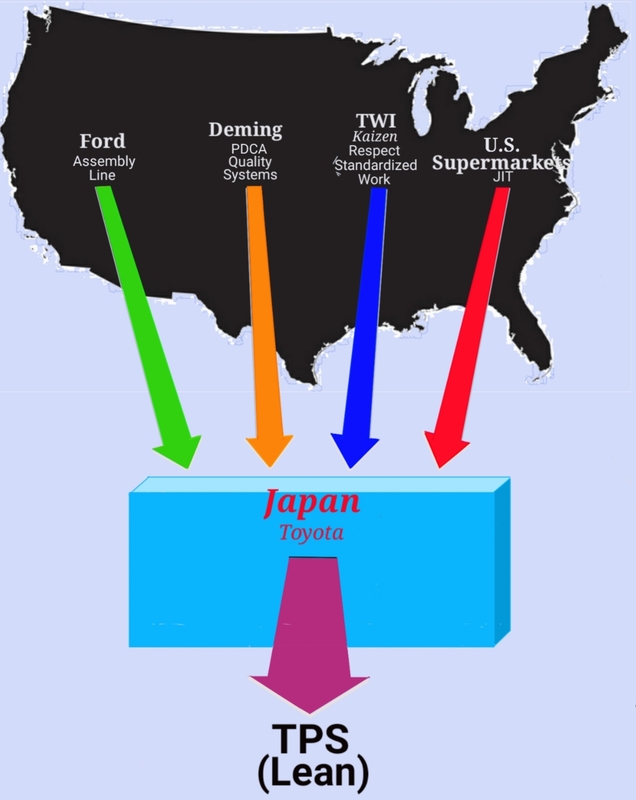 Now, while it is true that Lean did come from Toyota via the Toyota Production System (TPS) and Toyota developed this in Japan, much of what originally went into it came from the good ole' U.S. of A. The first influence came from Henry Ford's idea of the assembly line and mass production, allowing the increased manufacturing of identical products by several orders of magnitude. These concepts included highly standardized parts, which also allowed for the quick replacement of defective parts with identical replacements, which saved time. But, the mindset was still based on inspecting and repairing defects after the fact instead of preventing defects, as Toyota had already been focusing on. Not to mention that most of these defects weren't caught until the whole auto had been built, so sometimes it was just as easy to scrap the car altogether. But, what the heck! 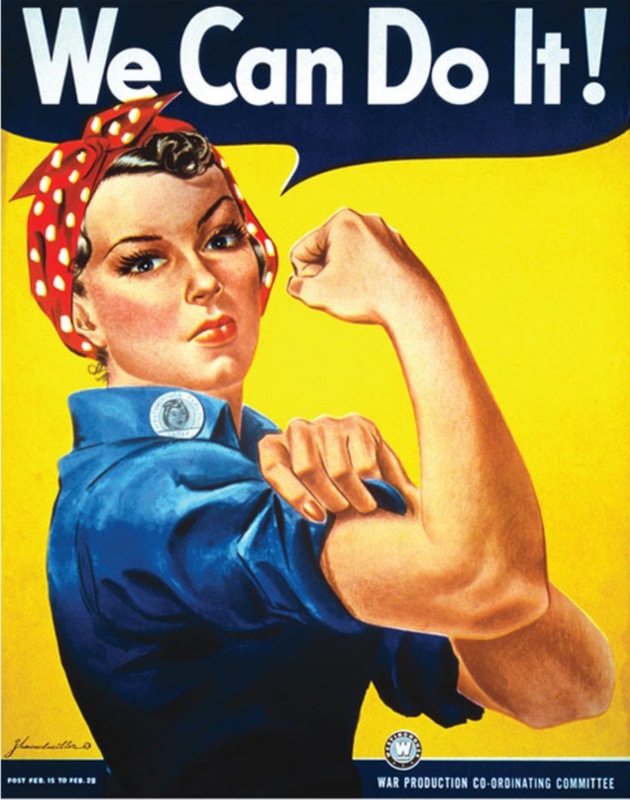 America was victorious after the war and had plenty of returning workers and plentiful resources. What’s a few thousand defective products and the time and labor to fix the situation? Japan was a defeated country with a scarcity of resources, which required them to be more creative. Toyota, as well as the rest of the world learned from Ford as he started the mass production assembly line. However, they would tweak it quite a bit in the years to come. 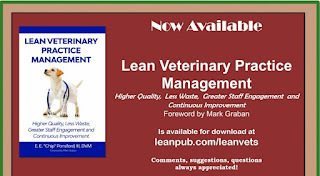 And, others would learn that Lean applies in environments that are not moving assembly lines. W. Edwards Deming was an engineer, mathematical physicist, and statistician during the twentieth century, becoming one of the greatest quality gurus of all time. In 1947, Dr. Deming was asked by the United States to go to Japan to help with the census during the post war restoration efforts. While he was there in that capacity, he gave a series of lectures on quality and process control to the Japanese Union of Scientists and Engineers. They eagerly incorporated his material into their thinking. 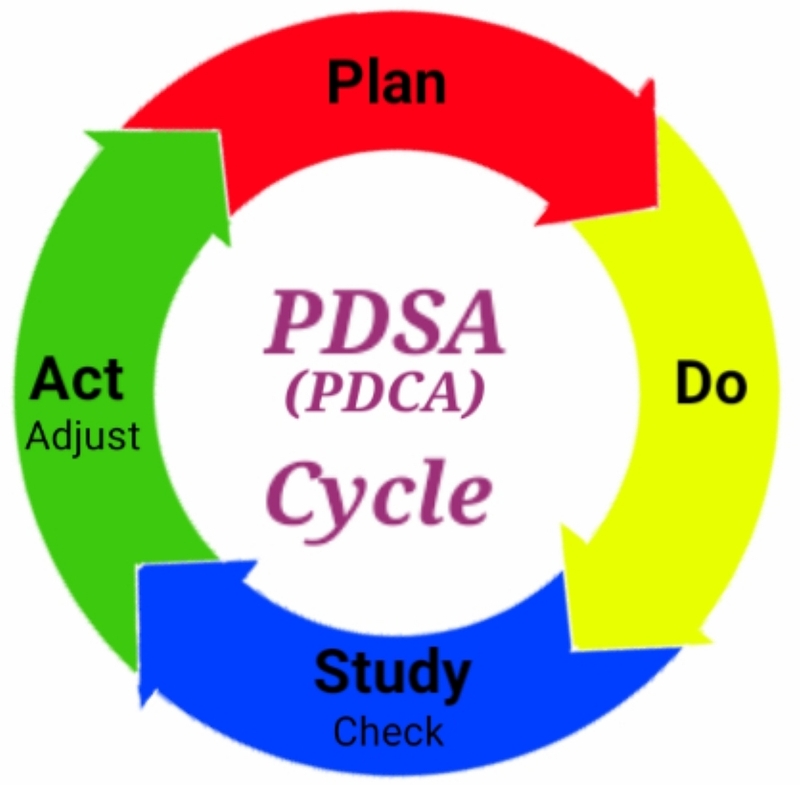 The Deming Prize is still given out in Japan for examples of the highest quality organizations. 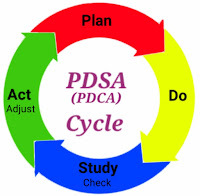 From Dr. Deming, Japan and Toyota learned about building quality into the product at the gemba, the PDCA cycle and systems thinking. The problem, of course, was that these new hires had little to no training in industry. Because the need was so immediate, the war department started the Training Within Industry (TWI) program. Training Within Industry was a predominately volunteer program to help get new workers up to speed as quickly as possible. Many of the TWI trainers were loaned to the project by manufacturers, which continued to pay their salaries. No manufacturing company was forced to utilize the TWI program. They had to request TWI help, and many did. There were also cases where TWI was used in healthcare. 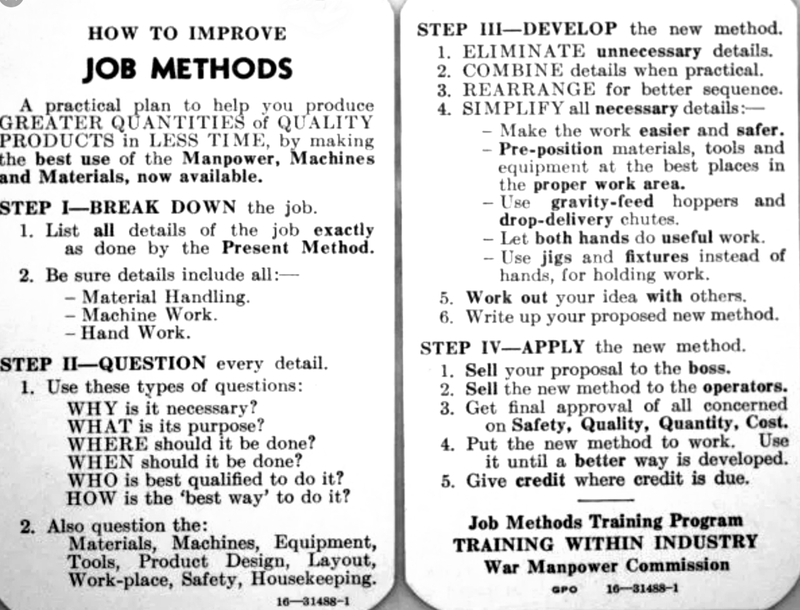 There were four training programs offered at different times called the Jobs programs. These included the Jobs Instruction (JI) course, the Jobs Methods (JM) course, the Jobs Relations (JR) and, later, the Jobs Safety (JS) course. The program was very successful and contributed greatly to the United States being among the victors. When the war was over and the United States was helping to rebuild Japan, the TWI programs were exported. Manufacturers, including Toyota, enthusiastically incorporated the concepts into their own cultures. There is still a copy of an original TWI manual in the Toyota company museum. Once the war was over, the War Department ended the TWI program, the men returned to their jobs, the industrial revolution was on its way, resources were plentiful, manufacturers didn't see the need of TWI in their companies and interest in TWI dwindled to almost nothing. In recent years, however, there has been a renewed excitement in the old programs and methods. 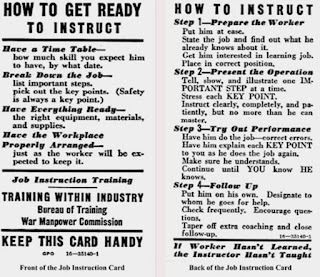 This course was designed to teach supervisors how to teach new workers. These people knew their jobs well and had a lot of experience, but many didn't understand how to teach someone else. This course showed them how to dissect the job into its individual steps and provided them with a standard way of instructing on a step-by-step basis. This was the nidus for TPS's standardized work. 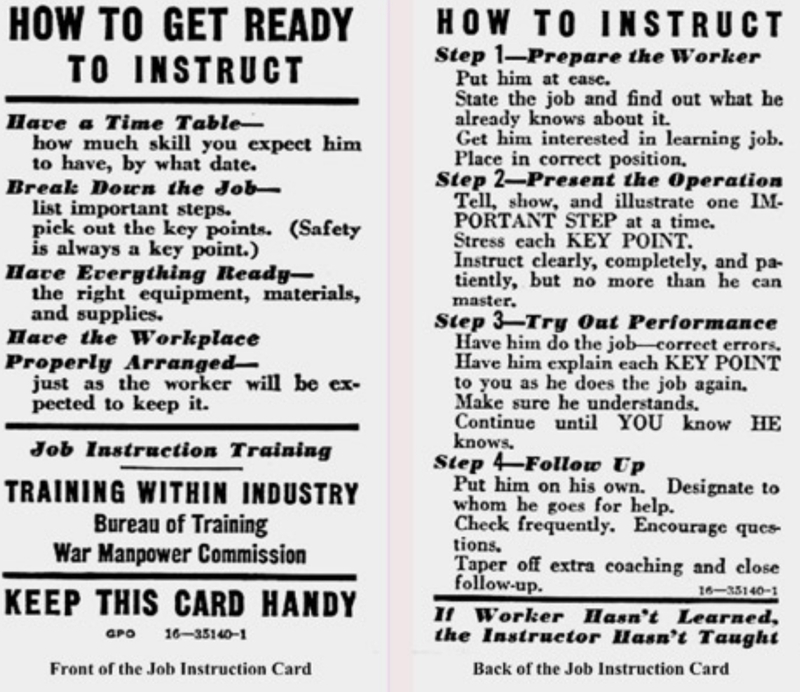 Training cards (as shown above and below) for each of the “J" courses were given to students to constantly refer to when dealing with their workers at their jobsite. This was necessary to protect the uniformity and integrity of the material throughout the project. 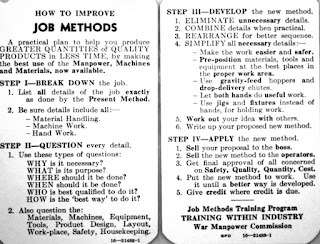 Job Methods taught how to improve the work being done. 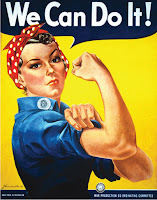 It was the impetus for kaizen or continuous improvement. 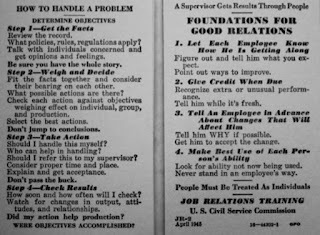 The Job Relations course instructed supervisors how the deal with interpersonal relationships and conflicts. Toyota's commitment to the respect of workers and people came from this information. 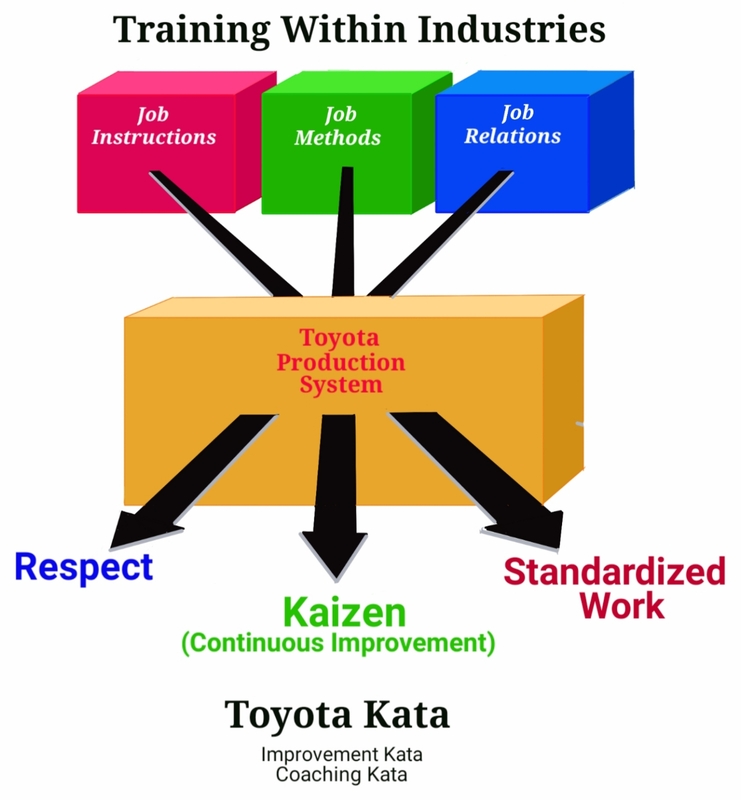 These early concepts eventually evolved into Toyota's Improvement Kata and the Coaching Kata. 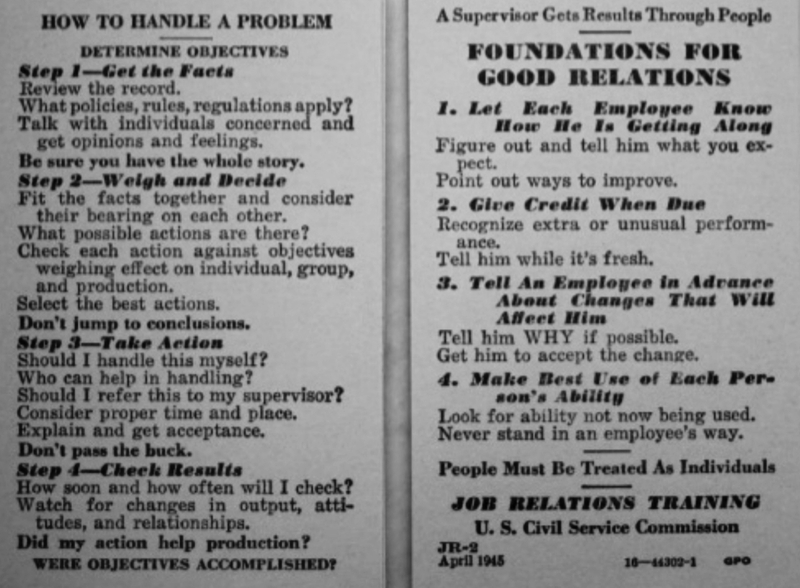 These are the standardized work of how managers and supervisors teach and mentor their direct reports. Toyota executives who had come to the United States to observe and learn were intrigued by the way our grocery stores replenished their shelves at night with only those items that had sold that day. By the next morning, when the store reopened, the shelves were full for customers to purchase and the cycle repeated. While there is definitely an Eastern philosophical hue to the Toyota Production System, the roots of much of the mindset, especially what we would consider the major concepts, originated from the United States. But, keep in mind that Toyota is not the same as every Japanese company. They've worked hard to create a special culture -- they've been willing to learn from other countries. How about you? Thank you for stopping by. Comments always welcome.